Hier finden Sie die von Elmar Brok gehaltene Rede in der Plenarsitzung des EVP-Kongresses am Donnerstag, 8. November 2018. In a world of constant change, Europeans want policies that inspire confidence. Confidence that Europe is leading the future. Confidence that Europe protects and provides security. Internal security and external security, but also social security. New technologies, production models and globalisation change our economic fabric and the way we work. It must be our aim to ensure that all business models contribute to our social model, and that all citizens continue to have acces…s to dignified work and social rights, just like the generations before them. Economic competitiveness and social progress must go hand in hand in a vibrant Social Market Economy. That is why the European Christian Democratic Workers stand firm on the European Social Pillar. Wherever in Europe the EPP carries political responsibility, we should be the Party that translates the Pillar into practice. The EPP should not only be the driving force for a Union that Protects. The EPP must also Lead the Union into the Future. Globalisation, new technologies and different production models have led to new aspirations and ambitions. It must be our aim to answer aspirations for a cleaner environment, in a way that is beneficial for both our health and our jobs. It must be our aim to meet ambitions and create opportunities, by promoting entrepreneurship, training highly skilled workers, integrating legal migrants and leveling the playing field for start-ups and SME’s, so they can grow into true European champions on the global market. 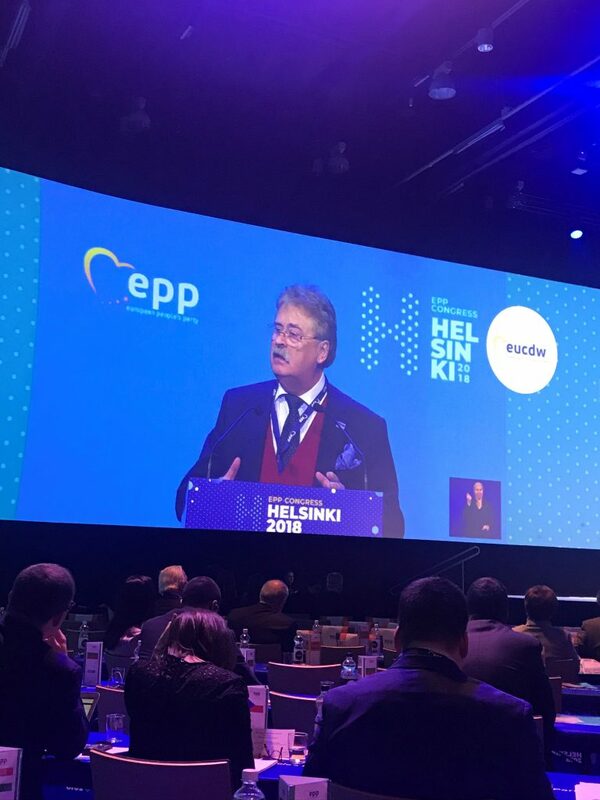 I am convinced that by orienting our policies on the Christian dignity of each person, that by opening our minds rather than folding back onto ourselves, the EPP will be the People’s Party of the future. Where others stir up envy and sow hatred, we must inspire confidence. The EPP must be the central force for a Union that Protects and a Union that Leads the Future. I am confident that our Spitzenkandidat will inspire that confidence and make the Union work for Europeans.